The third edition of the World Series of Poker received a large amount of attention in 1973. Thanks largely to the national publicity tour that “Amarillo Slim” Preston took part in during his year-long reign as world champion, a CBS camera crew was present to film a documentary featuring the event. The Series also expanded to five events total that year. Preliminary events included: $1,000 razz (Sam Angel -- champion), $3,000 deuce-to-seven lowball (Aubrey Day -- champion), $1,000 no-limit hold’em ("Puggy" Pearson -- champion), $4,000 seven-card stud ("Puggy" Pearson – champion), and $3,000 deuce-to-seven lowball (Jack “Treetop” Straus). This was also the first year that Eric Drache stepped in as WSOP tournament director. He was implemented as the first tournament director to address some concerns and complaints about the tournament structure and organization. Preston jumped out to an early chip lead to defend his championship title, but his run at a repeat win was short-lived when Jack “Treetop” Straus busted Preston with a heart-flush around midnight on the first day. Straus made strong a push for the championship that year, but he fell short in third place. This set up a head’s-up match between Puggy Pearson and Johnny Moss. Pearson had been dominant during the preliminary events at the 1973 WSOP, taking down two of the first four events. He carried his solid card play into the main event, where he busted eight players. Pearson had a tough challenge in facing Moss, not only because he was a two-time champion, but also because he doubled up through Pearson, and then eliminated Straus in third place. This gave Moss a large chip lead, but Pearson wrestled it away from the “The Grand Old Man of Poker” with aggressive play. Once Pearson held the upper hand he suffered a setback when Moss narrowly avoided elimination by making a larger two pair on the river against him. This put Moss squarely back in the chip lead, this time with a three-to-one chip advantage. The hour was late by this point and Pearson knew that Moss was tired. He switched gears and became content to lose a small pot if the situation wasn’t just right, which slowed things down. He was waiting to win a big pot, and change the complexion of the match once again. That strategy paid off when Pearson snapped of a huge bluff that Moss attempted to make on the river of one hand. Pearson risked his tournament life to make the call, but it proved a wise decision when he won 84,000 with two pair. It was now Pearson who held the three-to-one chip lead. A few minutes later Pearson moved all-in on a flop of Q 10 3 and Moss made the call. He flipped over K J and Pearson showed A 7 . The turn and river cards helped neither player, and Pearson won the title with ace-high. Pearson received his $130,000 first-place prize in a silver cup and Moss congratulated him. “If it had to be anybody other than me, I’m glad it was you, Pug,” said Moss. 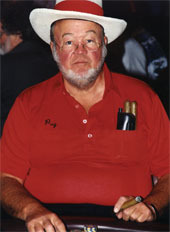 Pearson took the prize money from the event and purchased his infamous mobile home, the “Rovin’ Gambler,” which he used to fade the white line in search of his next poker game until his death in 2006.